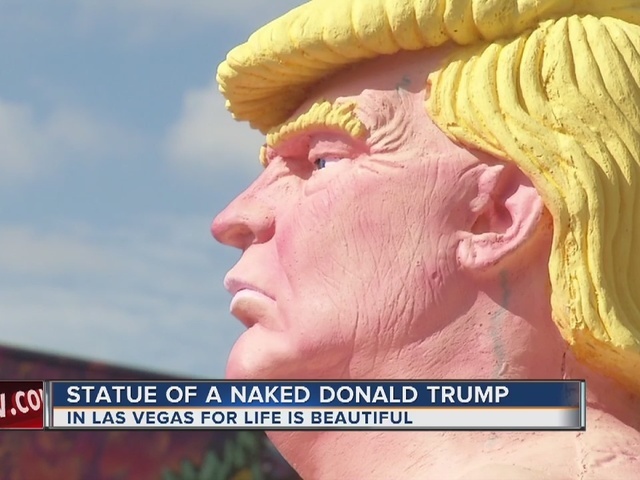 A Naked Trump statue has made it to Las Vegas. The naked, life-size statues of the GOP presidential candidate first popped up in various cities around the country in August. The statues were made by a Las Vegas artist named Joshua "Ginger" Monroe, who has a long history of designing monsters for haunted houses and horror movies. The artist says he wanted to show people what Trump looks like without his armor -- no expensive suits, no fake spray tans and no different than anyone else. Monroe has experience constructing monsters for haunted houses. He says the status is just another one of his monsters. Some people downtown appreciated the sense of humor with the statue. "Donald Trump, obviously with his popularity as far as TV goes, has probably made him a larger figure than he should be," said Joe Hulbert. "People are probably taking him more seriously than they should be, so this is great poking fun at the whole thing." The statues were commissioned by the activist group INDECLINE , who said that they wanted to strip away Trump's legendary confidence to reveal the fleshy mortal beneath the expensive suits and long ties. The title of the project was "The Emperor Has No Balls." The statues were originally unveiled in New York, San Francisco, Los Angeles, Cleveland and Seattle. The Las Vegas statue is located in downtown Las Vegas. The statue is near Fremont and 6th streets and is surrounded by velvet ropes. The statue of Trump appears to have a "constipated grimace" on its face, helmet-like yellow hair, a protruding belly, peach-colored flesh and no testicles. The statue is sure to draw a lot of attention this weekend because of the nearby Life is Beautiful music, art and food festival.